The ink is dry and the full text of the major trade deal between the US and 11 Pacific Rim countries, the Trans-Pacific Partnership or TPP, has been released to the public. And it contains plenty of lessons that can be applied to the ongoing negotiations between the US and European Union over the Transatlantic Trade and Investment Partnership, or TTIP, geared toward removing trade barriers between the two. One of the most controversial elements of TPP is the “investor-state dispute settlement” clause (or ISDS) – and the inclusion of intellectual property under its remit. Should a similar clause be included in the TTIP, companies could use it within the EU to usurp the will of both national and EU courts. And this could be very costly indeed. ISDS provisions are common in trade agreements. Their original purpose was to provide a level of security for foreign investors who were planning to invest in developing countries with a record of government instability and, in some cases, a history of expropriation of foreign-owned national resources. The ISDS legal mechanism enabled investors to obtain compensation under such circumstances. Now ISDS clauses are a standard part of most major trade agreements, even those agreed between developed countries, which have well-established property protections under their national constitutions. Both the 1994 North American Free Trade Agreement (NAFTA) between the US, Canada and Mexico and the 1993 Hong Kong-Australia Investment Protection Agreement include them. So, while the ongoing EU-US negotiations are not public, it seems likely that if such as clause appeared in the TTP, it will also be included in the TTIP. Especially worrying from a legal perspective is that the TTP’s investment chapter classifies intellectual property as a type of investment. If a similar clause appeared in the TTIP, investors would be able to take EU governments to court in the event of their intellectual property being “expropriated”. This is despite the fact that, as all IP lawyers know, intellectual property is not a type of investment. Intellectual property is a system of exclusive rights – for authors (copyright), inventors (patents), and traders (trade marks). It is granted by a state or supra-state actor, such as the EU, in order to recognise and encourage further creativity, research and development, and trade. But intellectual property law does not protect a person’s investment, as such. It is designed to protect what results from that investment. So creative works of art, literature, music and film are covered by copyright; new inventions are protected by patents; and logos and brand names are viewed as trade marks. Yet, if a person’s investment does not result in a new original work or a new invention, then there is no IP protection. There is, in effect, nothing to protect. 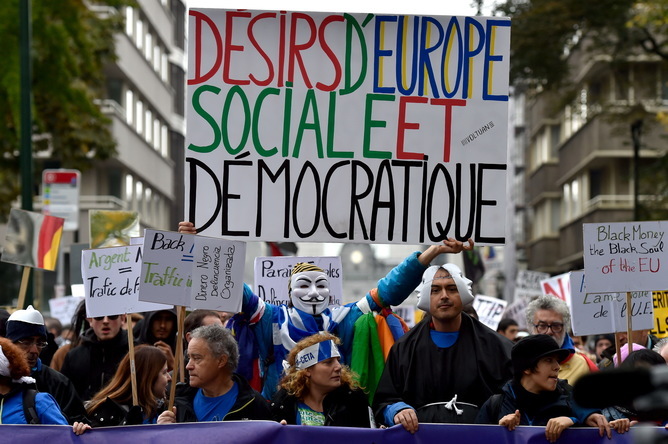 Campaigners against TTIP have criticised it for being undemocratic. By viewing IP as an investment, the TPP and, potentially, the TTIP run the risk of undermining the right of the EU and individual countries to make legal and judicial decisions regarding the limits of IP protection. If an ISDS clause is included in the TTIP, it would mean that if the EU, or one of its member states, decides to pass more flexible IP laws – be it to enable free speech or restrict branding in the interests of public health – those governments could run the risk of being sued by companies. We know this is a danger because the intrusion of ISDS into the field of IP law has already begun. In 2013, the American pharmaceutical company Eli Lilly filed a legal action against Canada at a NAFTA court. Eli Lilly argued that the Canadian courts’ invalidation of two of their patents – due to insufficient evidence of the drugs’ stated benefits – was a violation of the treaty’s expropriation rules. The use of ISDS to challenge the invalidation of patents is a clear attack on the principle that national courts have the right to determine matters of patent validity falling under national legislation. It is accepted within the international patent system that a court invalidating a patent cannot be an example of expropriation, as the court has decided that the patent should never have been granted in the first place. Eli Lilly made an investment, but they did not produce something patentable under Canadian law. Despite this, the ISDS dispute continues, and will prove costly for Canada to defend. A similar challenge has been brought against Australia in the field of trademarks by Phillip Morris Tobacco. Since 2012, Australia has had a system of plain packaging for cigarettes. It has led to plummeting smoking rates, illustrating the impact of removing branding from cigarettes. Tobacco companies objected to this move, however, and challenged it under Australian trademark law. The High Court of Australia found that the state had acted legally in restricting the use of tobacco company trade marks in this way. Under substantive trade mark law, that ought to have been the end of the story. Yet, under the ISDS provisions of the Hong Kong-Australia Investment Protection Agreement, Australia now faces a massive claim for compensation for this alleged expropriation of investment. There are therefore inherent dangers in ISDS provisions. And while we do not know what is taking place behind the closed-door TTIP negotiations, we should warn against the inclusion of intellectual property within any potential ISDS provisions.